The head of British Airways has branded two-hour queues facing travellers at Heathrow's passport control as a "border farce." BA chief executive Alex Cruz said passengers at the London airport are regularly facing queues "significantly worse" than elsewhere across the continent. 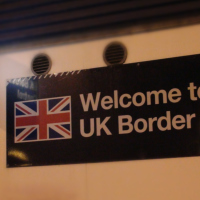 Mr Cruz called for the government to focus on tackling lengthy queues, instead of the reported idea of designated lanes for UK passport holders after Brexit. Writing in the Times, Mr Cruz said the waiting times were unacceptable, and well below target times at passport control. He said: "Two-hour queues are fast becoming the norm for those visiting from outside the European Economic Area (EEA), despite a target of no more than a 45-minute wait. "Even EEA citizens wait almost an hour. This is unacceptable, yet Nick Jariwalla, the head of Border Force at Heathrow, said recently that things were unlikely to change and it was unreasonable for his team to be expected to meet their targets." Mr Cruz, who succeeded Keith Williams as CEO in April 2016, said the airport has missed its target for non-EEA arrivals more than 6,000 times this year. He wrote: "Queues are significantly worse than at many other major world airports. What kind of message does this send, as we try to build links outside the EU?" A number of arriving passengers at Heathrow's Terminal 4 were forced to wait three hours before being processed due to "lack of staffing" during England's second-round game against Colombia on July 3. A Home Office spokesman said: "The vast majority of people who arrive at Heathrow get through the border within our service standards. "But we understand the frustration for those who have experienced longer waits and remain fully committed to working with our partners to reduce waiting times as far as is possible. At the same time, we will not compromise the essential checks we carry out at the border which keep our country safe. "We are making sure Border Force has the resources it needs and are deploying 200 additional staff at Heathrow over the summer." If you're a non-EEA resident and are travelling to the UK in the near future, make sure you have the right insurance cover for you by checking out our dedicated travel insurance options for non-EEA residents.